The essential qualities apply to reports of both forecast and actual performance. The performance information should cover all significant services, and be clearly set within the broader context of the organisation’s strategic objectives. A good test of relevance and reliability of the performance information is whether an organisation uses its externally reported results to help it make decisions about its future services or priorities. All performance indicators in the forecast document must be reported against, and the targets presented alongside the results. Any additional significant performance matters that arise during the course of the year should also be disclosed. Prior year comparatives help users by providing context to current year performance. Reporting trends can also provide valuable information, particularly for indicators on the impacts of services. The indicators need to be supported by insightful and fair analysis and commentary, especially where actual performance differs markedly from planned performance. Also, rich performance reporting is wider than the set of performance indicators – readers need to be able to understand the performance story. Organisations need to have robust systems and processes in place to collect the required data. More information on the features of good performance reporting is available in our past publications. Although these publications may not reflect current terminology or legislative requirements, the principles of clear and meaningful performance reporting discussed in them remain unchanged. 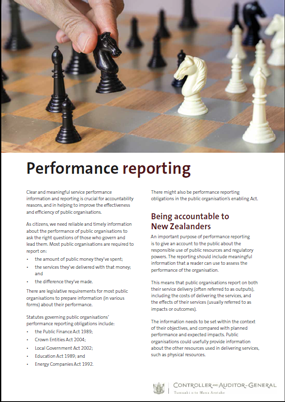 Similarly, while each sector of organisations has different legislative performance reporting obligations, the principles of good performance reporting are the same.